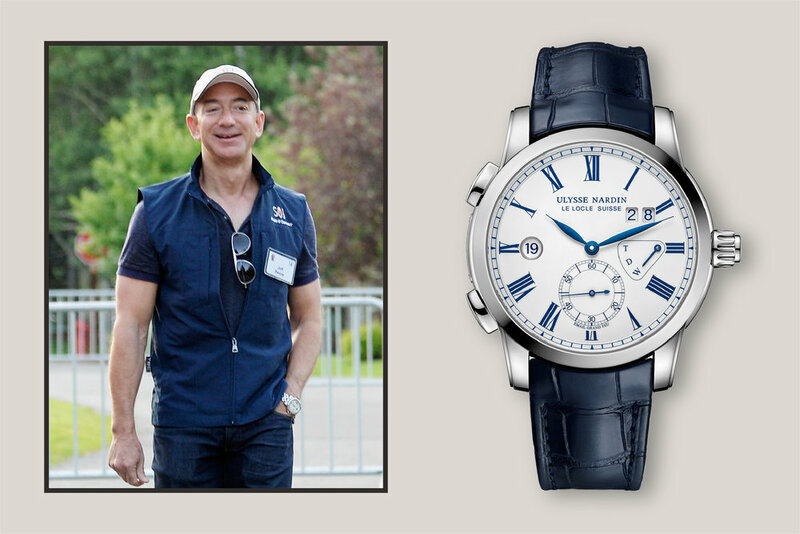 Amazon CEO Jeff Bezos jet-sets in a piece by collector-favorite Swiss watch brand Ulysse Nardin. The watch of choice for this Silicon Valley based startup guru is a Dual Time on a steel bracelet. This watch is ideal for someone who travels frequently and wants to keep their eye on the hour in two cities at once. Our favorite from Ulysse Nardin’s current Dual Time collection offering rings in at $12,900 and pairs a white enamel face accented by blue hands with a blue alligator leather strap. Henry Goulding, the new hit star of the film adaptation of Kevin Kwan’s bestseller Crazy Rich Asians, was recently described by GQ as a ‘Lover of Expensive Timepieces.’ Befittingly, then, Goulding sported a dressed-up Omega in the blockbuster. The Omega Seamaster DeVille worn throughout the film was Goulding’s own vintage piece – but you can shop a similar model at Troverie. Don’t be scared off by the ‘crazy rich’ association – the DeVille collection starts at $3,500. The “King of Cool” reportedly chose this specific model of watch himself when filming the 1970’s film Le Mans. The watch, then an Heuer and now continued by TAG Heuer in their current collection, has a blue face that paired with the actors striking blue eyes against his white racing suit. Will Smith wears a Hamilton Ventura in both Men in Black and Men in Black 3, and the young Agent O, played by Alice Eve, also sports a smaller ladies' Hamilton Ventura in Men in Black 3. The film-favorite collection by American watchmaker Hamilton was first introduced in 1957, and sports a funky, asymmetrical face. While the MIB cast stuck with black straps and silver faces, the watch also comes in gold and leather versions, all available on Troverie starting at $845. While the jazz king’s personal choices were plenty controversial, it’s hard to argue that Miles Davis’s style was anything but well loved. Davis, who was usually dressed in a jaunty Italian suit, was rarely without a Breitling Navitmer watch between 1960 and his death in 1991. The watch boasts a hyper-masculine 46mm diameter, a chronometer-certified, high-performance self-winding chronograph-caliber, and is available new and fully authorized on Troverie for $8,215. The Duke of Sussex has been spotted in a few different watches over the years – always rugged models that are in line with his military background. One such watch is the Breitling Aerospace Avantage – a limited model available only to Apache pilots who have flown combat missions. Our pick for the guy who wants a sporty Breitling with a blue dial like Harry’s: the Colt Automatic, which boasts a 44mm face, date function, and water resistancy up to 200 meters. In the 2015 Bond flick Spectre, Daniel Craig sports a particularly well-loved diver: The Omega Seamaster. The Seamaster Diver 300m Co-Axial is far from the first watch from the brand to be featured in the storied series – Omega has long since been a partner of the Bond franchise, beginning in 1995 when Pierce Brosnan wore an Omega Seamaster Professional 300M in GoldenEye. Silver screen siren Elizabeth Taylor was captured taking a break from the camera action backstage on the set of Cleopatra in a glamorous and appropo Bulgari Serpenti. The watch, which wraps around the wrist multiple times and is finished with a pink cabochon stone on the crown, is available in a day-to-evening stainless steel dual-wrap model as well as many more statement pieces – like the all gold one worn by Taylor. Our pick is the dual wrap version in mixed metals, which pairs beautifully with either silver or gold jewelry. Matt Damon, whose stealth alter-ego Jason Bourne has a penchant for TAG Heuer, seems to have a soft spot for the brand off the screen as well. The A-lister was snapped courtside wearing a classic Aquaracer, a sturdy, can’t-go-wrong sports watch. The Aquaracer Chronograph, one of our favorites from the collection, is water resistant to 1,000 feet, features a date indicator, and is available for $2,200 on Troverie. You’re all set. Thanks for joining us!